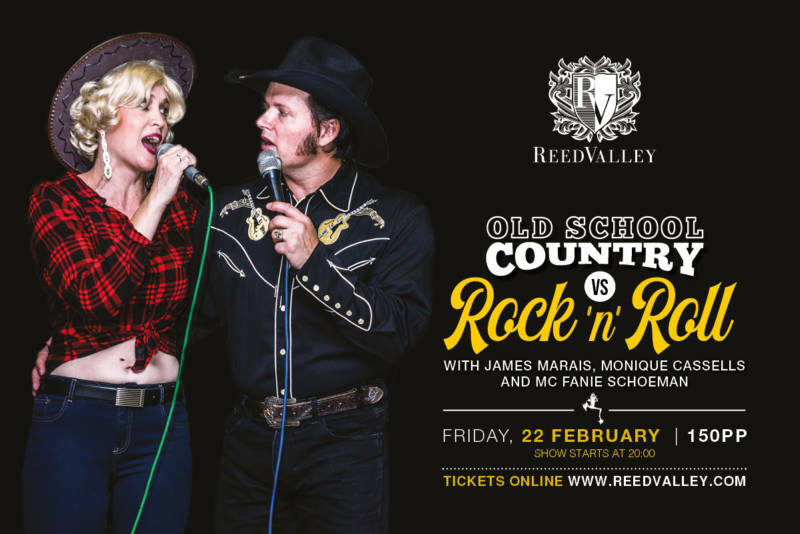 The ever-popular James Marais, Monique Cassells and Fanie Schoeman are back on the ReedValley stage on Friday, 22 February! Get your tickets today, as they are sure to sell out quickly! Tickets are available online at R150 each. Doors will open at 18:30 and the show will start at 20:00. James Marais and Monique Cassells are renowned for their “Oldies But Goldies” show, which has brought them sold-out attendances whenever they have performed at ReedValley. In 2017, they successfully launched their “Old School Country Legends” tribute, which was also a hit at ReedValley. They have now devised the “Old School Country vs Rock ‘n’ Roll” show, which consists of the best of their “Old School Country Legends” show, paying tribute to some of the Country legends from the ‘50s to the ‘80s, as well as some great rock ‘n’ roll/oldies hits from their “Oldies But Goldies” collection. Some of the music featured is by country artists such as Johnny Cash, Patsy Cline, Dolly Parton and Don Williams, as well as legends from the rock ‘n’ roll era such as Elvis Presley, the Beatles, Buddy Holly, the Everly Brothers, Roy Orbison, Creedence Clearwater Revival and many more. The show is a mini-theatrical experience, featuring the dynamic vocal and visual performances of James and Monique, alternating as a duo and individual performers, who also do multiple costume changes throughout.